Good product, fast delivery and fits the phone perfectly. Exactly what I wanted orders Samsung S9 didn't know it was all glass . Cheap plastic crap, meant to protect the phone. A nappy can do a better job. This is my 2nd one! The 1st kept my galaxy s7 pristene after I kept dropping it.. This is going to keep my galaxy s9 in just as good condition..
Really pleased with this case. Slightly chunkier than others, however that works in the favour of the more clumsy of us (me included). 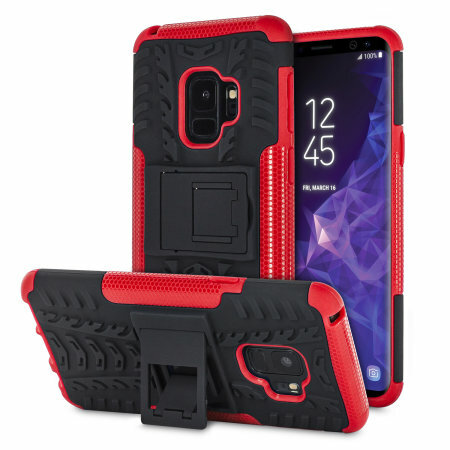 Great grip on the back - the Samsung Galaxy S9 has no grip whatsoever without a case. The stand that clips out on the back is perfect for watching videos/films etc. - no more searching for items to prop my phone up against! Would definitely recommend! Perfect fit, robust design. Love the little kick stand, great for watching movies. Stand option is quite handy. Not at all bulky. I really wouldn't want to find out how effective this case is by dropping my phone. ??? ?